Making the most out of all spaces, the mezzanine not only serves as a comfort station complete with an ice maker and drink coolers, it also offers bait storage and functions as an aft helm station with pod joystick controls in a recessed compartment. The cabin is dual-functioning with the helm and salon space wrapped in the richness of custom book-matched cherry veneer and trim accents. 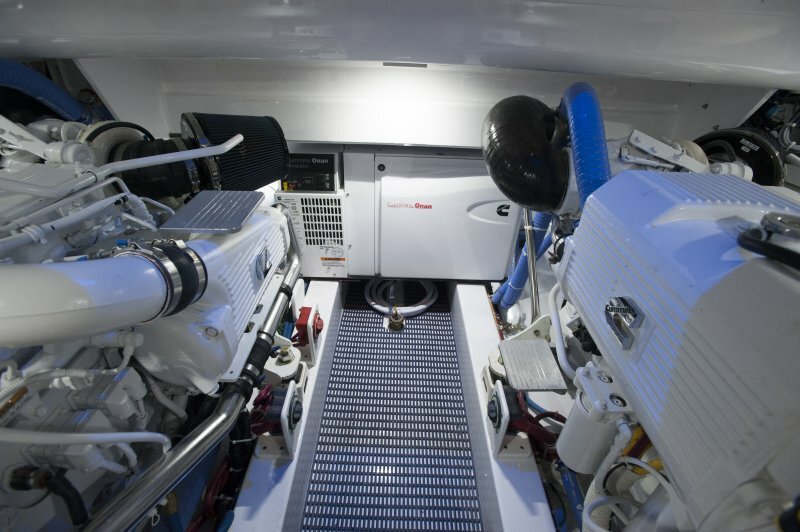 Power comes from a compact pair of 600hp Cummins QSC motors and C-9 Zeus pods which provide space for a second stateroom below the salon. 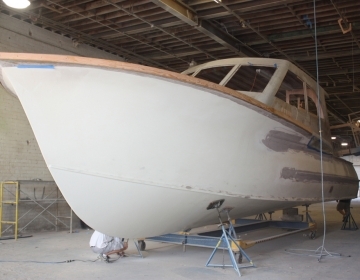 Raising the cockpit floor, an Alexseal® premium yacht finish adorns one of the most accessible engine room spaces for a boat of this size. In addition to the power package & pod drive system, an ISO boost unit, watermaker and Cummins Onan Generator are all positioned for convenient reach. 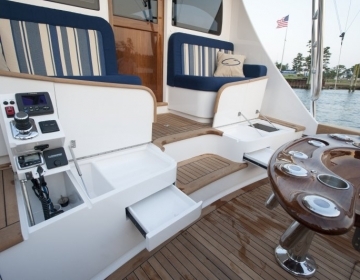 Walking in the cabin door, you step into a dual-functioning helm and saloon space wrapped in the richness of custom book-matched cherry veneer and trim accents. Notably used by Cadillac as their interior accent wood for its perfect balance of luxury and durability, Sapele is matched with maple on the floors with a satin finish throughout. Sapele lumber runners are also used in the headliner to provide a luxurious accent, and to help make the cabin space feel even larger. Two Stidd helm chairs with a matching electronics dash wrap are the foundation for the interior driving station with pod joystick controls. 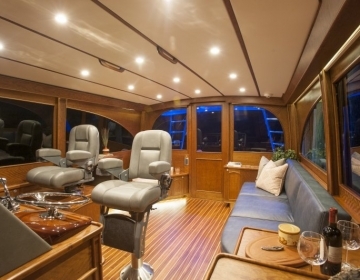 Guests can keep the captain company in a Jarrett Bay signature bucket seat and sofa with dry storage underneath; or lend a hand in the well-appointed galley with hidden Sub-Zero refrigerator/freezer units, a hidden microwave and maximized storage space and cabinetry. Built with Canyon overnighters and extended Caribbean cruising in mind, the Jarrett Bay 43 HTX comfortably sleeps four in a forward queen berth stateroom and a side-by-side bunk room beneath saloon. This unique bunk room bonus space is afforded due to the smaller footprint needed for the engine room thanks to the compact pod drives. 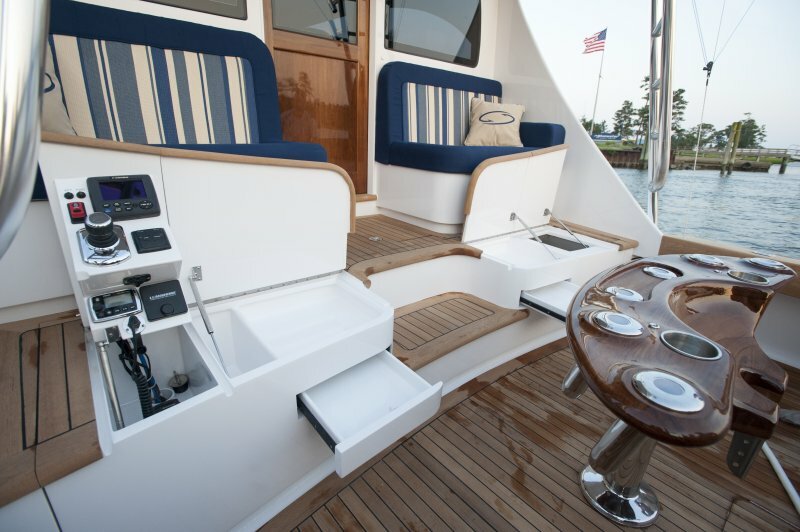 The queen bed lifts for custom rod storage, and hanging and storage lockers are found centrally and on the outboard hull sides. Keeping things custom all the way into the head, here you will find a hand-carved, high-gloss Sapele sink and matching counter top, custom wallpaper and a teak trimmed, seamless glass shower entrance. With an intent focus on the business-end of this Jarrett Bay, the owner & captain’s cockpit order definitely did not fall short on any detail. Ensuring access to the twin 600hp Cummins QSC motors and Zeus pod drives did not encroach on deck space, the 43HTX’s hydraulic cockpit decklift delivers in both form & state-of-the-art function. 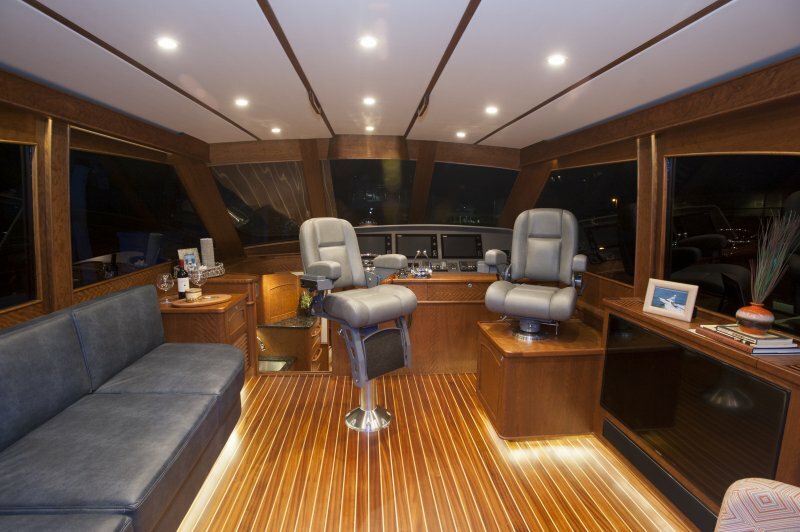 Making the most out of all spaces, the mezzanine not only serves as a comfort station complete with an ice maker and drink coolers, it also provides bait storage and functions as an aft helm station with pod joystick controls in a recessed compartment . Also serving double-duty is the stern fishbox that doubles as a live well. Keeping the aft deck space clear of clutter from head to toe, the electric teaser reels are flush mounted into the cabin overhang, and a low-footprint Release Marine Battle Saddle perfectly complements Jarrett Bay’s finely crafted teak cockpit accents, as well as the custom metal, CNC-cut Jarrett Bay logo drain covers. 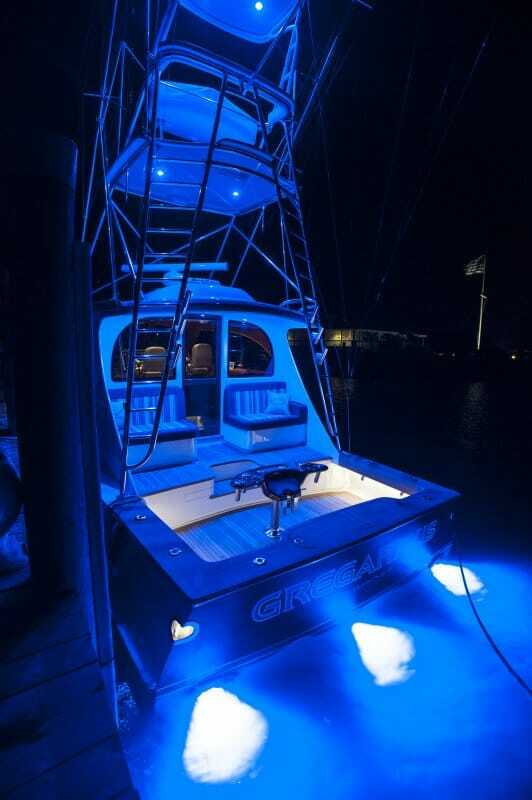 Look down after dusk, and you’ll find your own aquarium forming around custom underwater transom LED lights. Walk forward safely using a hidden finger rail on the cabin sides to access the custom anchor pulpit and windlass, and look back at the wide-view wrap-around windows with wipers for maximum visibility in unfavorable conditions. Look up to find FLIR technology, custom LED tower lights, pod joystick controls, teaser reel remote, and actuated storage drawers all conveniently accessible in the buggy top. Wrapping it all up in a shiny Alexseal Kingston Grey coated hull, a Josh Everett Nautical Designs hand-painted transom, and topped off with a custom buggy top, the “Gregarious” is ready to share the quality, passion and dedication of Jarrett Bay’s custom Carolina construction with all she may encounter. Would it be possible to have some information emailed to me on the 43′ Express? I.E. below deck layout, helm station, etc. Thanks for your interest Dr. Martens! We’ll have one of our sales associates get in touch with you directly. I would like to speak with someone about an express / open boat in the mid 40 foot range. I would prefer a 2 stateroom boat, but it is not mandatory provided it has a spacious cabin with a salon area that can convert into berths. Rod Storage is also a requirement, So when someone has chance I would like to speak with your 43 and 46. Thanks Michael, you should have received a response directly from a sales representative. Please let us know if you have any further questions! Good afternoon and thank you for your inquiry. We will be sending you a brochure with the requested information. I will have one of our staff members from the sales department get in touch with you directly. Thanks for your Inquiry Joe – someone from the sales staff should be in touch with shortly! Also, if you check out this hull’s renderings gallery there is a proposed interior layout. My father and I are looking to upgrade from our 35′ to something in the 42′ – 46′ range. 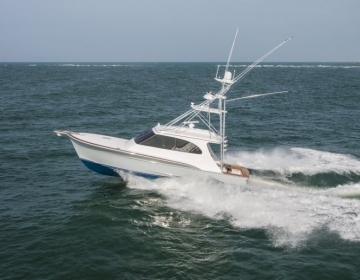 We are just starting to look at the custom boat manufacturers like Jarret Bay Boatworks, and must say your boats have absolutely beautiful lines and appear to have some of the best quality in the industry. Could I please have some information on the boat and an estimated asking price? Looking forward to seeing (and hearing) at the Big Rock next week. Can you forward more information on the 42′ Express currently under construction; please include proposed finished date and pricing. My fishing team have asked me to line up a Jarrett Bay factory tour on our lay day …. is that possible? Thanks for your interest Joe – Randy will be in touch with you directly. Scheduling a tour shouldn’t be a problem. Bob has responded already, but please let us know if you have any further trouble touching base with him Jose. Thank you for your interest John! A new construction representative should have been in touch with you directly via email concerning your inquiry. If you have have any more questions please let us know! Very interested on the projected preformance and any other info. Thank you for your interest Mr. Hoft – a representative will send you some further information directly via email! We Were Fishing About A Month Ago West Of Block Island And Spotted Her Right Away . Didn’t Need To See Her Name . I Told Everyone On Boars That’s A 43 Foot Jarrett Bay Custom . It’s Owner Is From Newport R.I. . She Is Beautiful. The Fish Weren’t Biting So We Watched Her For An Hour Or So. Great Idea , Great Built Congrats To You And The Owner !!!!!! 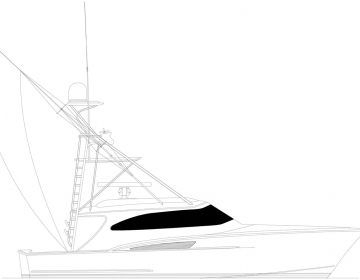 please send price for 43′ Jarrett Bay as shown. Hi Patrick, you should have received more details directly via email, please let us know if you have any further questions. Thanks for your interest! Hello! Im interested on finding out for specs and pricing of this boat?